Our House Hissla is located in Barr, a typical Alsatian village. You will be charmed by its quiet situation, and all the facilities within walking distance (bakery, tourist office, restaurants). Completely renewed with care, with a surface of 65m2, the habitation allows to welcome from 2 to 5 people. You will find all the necessary comfort for a very nice stay. The beautiful terrace will allow you to enjoy outside some Alsatian specialties or a glass of wine! The bathroom with a big Italian shower, wash machine and washer dryer, double sink. The Living room, with a 5 places sofa which can be easily converted in a comfortable double bed (140x190cm) with a think mattress of 18cm, flat TV, Wi-Fi. 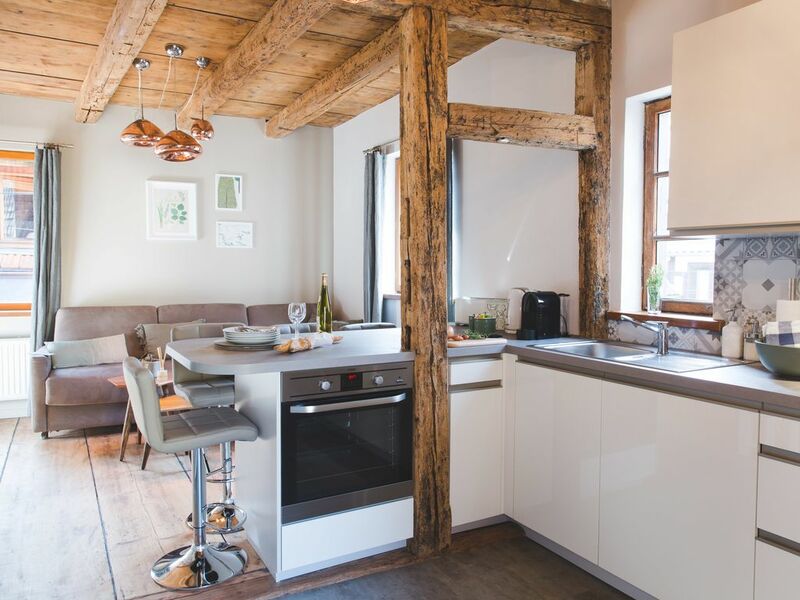 A full equipped kitchen (dishwasher, multifunction oven, cooktop 4 burners, fridge with freezer compartment, microwave, Nespresso coffee machine, filter coffee machine, bread toaster, water boiler) with direct access to the terrace. A big bedroom with a queen size bed, and a desk. Bed linen and towels are provided, beds are ready for your arrival. The Alsatian Wine Route invites you to discover the region and its wine producers from Marlenheim to Thann you will go through postcard landscapes: ruins of Middle Ages castles, the flowery villages, the vineyards, winstubs. The holiday house was more than we expected. There was all we needed. We simply loved the house and absolutely one of the best we have had. Maison propre , rénovation récente. Le confort y est , matelas confortable. Attention si vous avez de jeunes enfants ,chambre en rez de chaussee et une autre au 2ème etage . Concernant le séjour vous êtes situez entre Colmar et Strasbourg. Vous pourrez visiter le château de haut koenibourg , le mont saint Odile ( le couvent) et les petits villages typiques alsaciens . Seul bémol :une seule toilette dans salle de bain au rez de chaussée et 2eme chambre au 2ème étage 😯. Notre séjour à 4adultes une semaine à Barr fut une pleine réussite. Entre Colmar et Strasbourg, région agréable pour visite caves et marchés de Noël variés. Quelques kilomètres pour retrouver la neige dans les cols et ce fut génial à vivre.A conseiller vivement comme location! Comfortabel. Gunstig gelegen, zowel tov winkels en voorzieningen als ook tov bezienswaardigheden in de streek. Perfekt, kann man nur empfehlen!